The first list shows the stories I would nominate for the short story Hugo Award as of today, while the second list contains my near misses. (Both lists are in alphabetical order by author.) There is still a month left before the nominations deadline, so I will update this if I run across anything else exceptional in that time. Suggestions of stories I may have missed are welcome. My single favorite short story of 2007 is “Sorrel’s Heart” by Susan Palwick. “Sorrel’s Heart” is a love story between a girl who literally carries her heart on the outside of her chest, and a sadistic yet oddly noble young man. It is a powerful, beautifully written piece, and I believe it would have a very good shot at the Hugo if only enough people read it. So do yourself a favor and go track down a copy of Palwick’s collection The Fate of Mice. That goes double if you are one of those folks complaining that not enough women have appeared on the Hugo shortlist in recent years. There has been a significant shift in the past couple years as to where one can expect to find strong SF/F short fiction. Until very recently, the best short fiction was largely confined to the major print magazines, notably Asimov’s, F&SF, Analog, and Interzone. While those magazines remain very good, much more excellent short fiction is now appearing in original anthologies and on-line. Six of the stories listed above are from original anthologies and three from on-line publications. Five years ago, the only on-line site that compared to the major print mags was Ellen Datlow’s SciFiction. Today, there is a great deal of short fiction on-line at Helix, Clarkesworld, Subterranean, Strange Horizons, Lone Star Stories, Baen’s Universe, and others that is well up to the standards of the major print magazines. If you are a member of Denvention 3 or were a member of Nippon 2007, and you read anything from 2007 that you thought was very good, PLEASE NOMINATE. Do not feel that you need to have read everything published in 2007 to be qualified to nominate, because no one has. 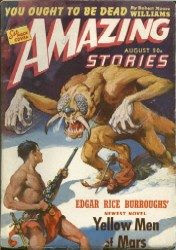 The Magazine of the Week is the August 1941 issue of Amazing Stories, with an Edgar Rice Burroughs cover story and great BEM cover art by J. Allen St. John. As discussed in an earlier BOTW (seen here), Amazing Stories was the first of the science fiction pulp magazines. This issue's cover story, "Yellow Men of Mars," is by Edgar Rice Burroughs, probably the most successful of all the pulp writers. Burroughs is best known outside science fiction circles as the creator of Tarzan of the Apes, but most fondly remembered among SF fans for his tales of John Carter of Mars. "Yellow Men of Mars" is a John Carter story, later incorporated into the novel Llana of Gathol, tenth in the John Carter series. The St. John illustration on the Magazine of the Week is one of my favorite examples of pulp era BEM cover art. Like any specialized community, science fiction fandom has its own peculiar jargon. (You are an SF geek, for example, if you can translate the statement, "I can't decide whether to go check out the filk or just gafiate.") Any serious SF fan will instantly recognize the creature on the cover of the Magazine of the Week as a traditional skiffy BEM, or "bug-eyed monster." A first edition may be especially collectible because the book become a classic or because the author went on to have a distinguished career. And then there are the books that are collectors' items simply because they are too outrageous and absurd for any collector to resist. 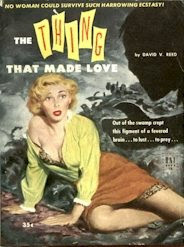 In the latter category, the Book of the Week is The Thing That Made Love by David V. Reed. This is a first printing, paperback original, published in digest format by Uni-Book in 1951. The novel had previously appeared in the pulp magazine Mammoth Detective, but under the dull title The Metal Monster Murders. Uni-Book changed the title, added cover art of a woman in a torn shirt and lacy bra, all under the tag line "No woman could survive such harrowing ecstasy! ", creating perhaps the single most exploitative edition of a science fiction mystery ever published. David V. Reed was the pen-name of David Vern (born David Levine, but no relation to the David Levine featured in our August 31, 2006 Magazine of the Week ). He started out as a minor author for the science fiction pulps before going on to a bit more success in comic books, authoring a number of Batman comics. By coincidence, a David V. Reed story appears in one of my personal favorite pulp magazines, also with an outrageous cover, illustrating a story by the most successful pulp writer ever. You will see that magazine, and learn what a "BEM" is, next week. The Book of the Week is 20 Million Miles to Earth by prolific pulp and screenwriter Henry Slesar, published in 1957 by Amazing Stories. This was the first and only digest novel Amazing Stories issued, and it is the digest-format book most prized by collectors today. 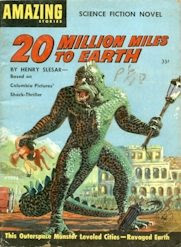 20 Million Miles to Earth is a novelization of the 1957 film of the same title, featuring a rampaging monster created by special effects legend Ray Harryhausen. A great part of the book's appeal to collectors is its campy cover image of the salivating monster. We'll have another digest book that is collectible for its outrageous cover art (and title) next week.